New Swans coach Adam Pickering. A “YOUNG” group of players will carry the load and excitement for Swan Districts in 2018, following the retirements of key veterans including long-time captain Tallan Ames. 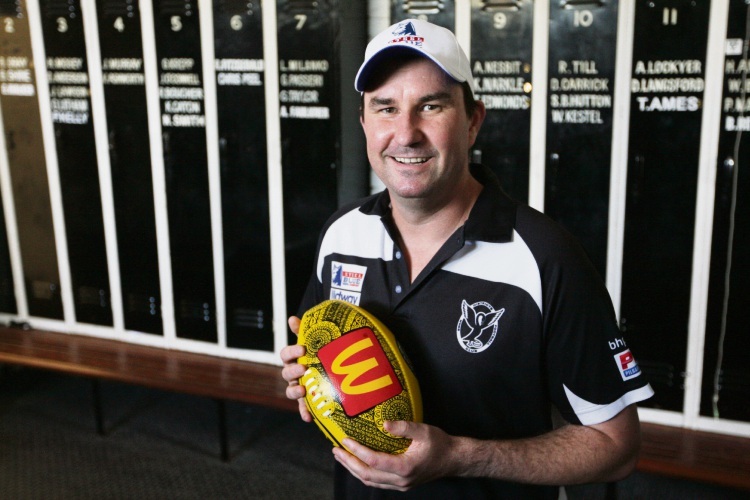 Ames retired after playing 263 games including the 2010 premiership, while former AFL players Ryan Crowley and Jamie Bennell also retired following one-year stints in the WAFL. Former Carlton midfielder David Ellard, who also joined the club in 2017, has taken up the captaincy after serving as co-captain with Ames. The Black Ducks lost in the semi-final against South Fremantle last season. The club’s biggest signing over the summer is former Carlton, Greater Western Sydney and Fremantle midfielder Rhys Palmer, who will be sharing his experience with colts players. Senior coach Adam Pickering, who moved from East Perth into his first senior coaching role in November, said he was “very excited” for the upcoming season, because the group bought into a new program and game plan. “It is a pretty young group with a few fresh faces, which always brings an element of excitement,” he said. “Our top-end talent, I believe, is on par with anyone in the competition. Pickering said his younger players have been great in the pre-season but midfielder Jesse Turner had been “wonderful” since day 1. “We have secured Rhys Palmer and Steven Payne and a number of younger colts players coming out of our development program,” he said. Swan Districts kick off season 2018 at Lathlain Park on March 31 against Perth. Your biggest game in 2018: I always believe our next game is our most important. Rd 1: v Perth @ Lathlain Park, March 31. Rd 2: v Peel Thunder @ Steel Blue Oval, April 7. Rd 3: v Subiaco @ Leederville Oval, April 14. Rd 4: v West Perth @ Steel Blue Oval, April 21. Rd 5: v East Fremantle @ Steel Blue Oval, April 28. Rd 6: v South Fremantle @ Fremantle Community Bank Oval, May 5. Rd 8: v East Perth @ Leederville Oval, May 26. Rd 9: v Perth @ Steel Blue Oval, June 2. Rd 10: v Claremont @ Claremont Oval, June 9. Rd 12: v Subiaco @ Steel Blue Oval, June 23. Rd 13: v Peel Thunder @ Bendigo Bank Stadium, June 30. Rd 14: v Perth @ Steel Blue Oval, July 7. Rd 15: v East Perth @ Steel Blue Oval, July 14. Rd 16: v West Perth @ HBF Arena, July 21. Rd 17: v East Fremantle @ East Fremantle Oval, July 28. Rd 18: v Subiaco @ Leederville Oval, August 4. Rd 19: v South Fremantle @ Steel Blue Oval, August 11. Rd 21: v Claremont @ Steel Blue Oval, August 25.